At Localytics, we have frequently touted the importance of collecting detailed data about your app and how people are using it. Once you have all of that data it’s hard to know what to do with it. Of course, you build reports and analyze performance but there is so much more that your mobile data can enable, outside of your app. Below are some of the ways your mobile data can be used across your martech stack to boost the performance of all your other channels. By connecting Localytics to your CRM, you’re able to build the most complete profile of your app users who may also exist as contacts or customers in your database. With all of this information, you can more accurately gauge the engagement of your database, rather than exclusively relying on email opens or website visits. With activity in your app synced to your marketing automation tool, you can start incorporating valuable app actions into your lead scoring criteria. It also opens the door to more targeted ad campaigns, emails, and recommended content on your website which leads to higher conversion rates across the board. App data gives you insights into your audiences’ behavior that you might otherwise miss. Cues about your users’ preferences, their in-app browsing behavior, or videos viewed can all be piped into a marketing automation tool for better segmentation. Your email lists and ad audiences will be much more targeted with all the additional detail. You can offer your promotions or exclusive sales to folks that will really appreciate and take advantage of them. You can also use app install dates and in-app purchase dates to inform anniversary, replenish reminder, and subscription renewal emails. You can also use Localytics to export custom audiences to Facebook and other ad platforms. Now you can grow your entire database by using your most loyal app users to create a lookalike audience. You’ll be able to get in front of the people that are most likely to engage with your brand and become customers. The data you get from app users can make your ad spend much more targeted and efficient. By passing information about which screens in the app they have viewed, like an upgrade page or different product pages, it’s easier to create retargeting ads that are really relevant to your users. In addition, if you are running ads targeting users who haven’t engaged with your brand in a while, sending app data to your ad platform can ensure you don’t waste money by showing ads to users that might not be engaging with your website or email, but are opening your app on a regular basis. Mobile location data can be a lot more accurate than what you get from an IP address alone and may be more up to date because phones are with app users all the time. With user location data you can run targeted, local campaigns. For example, if you have geofences set up around your stores, you can build segments of contacts that have been to specific locations and ask them about their experience. Location based segments can also be helpful for promoting upcoming events or store openings via email. Shoppers in the US are expected to spend 118 billion dollars shopping from their smartphones in 2018. Customers are also looking to serve themselves by using apps to bypass a phone call to customer service or a trip to the bank to deposit a check. Each of these interactions adds value to your relationship with customers and your business. 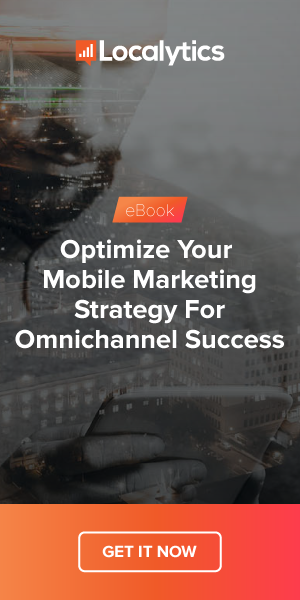 Whether the goal of your app is to increase revenue, reduce call center volume, or anything else, by sharing your mobile data across your business you can more clearly see how your app is achieving your objectives. Beyond that, your app is a goldmine of rich data that can be used across your company to boost the relevance and performance of your digital marketing. It’s time to start putting your app’s data to work. You can learn about how to export your Localytics data by checking the docs here and here.